BBG Hyderabad was launched on 21st February as planned, on a night when Hyderabad was targeted by terrorists who exploded two bombs in busy shopping area, killing 16 and injuring 120 innocent people. BBG Chennai Member, Gerry Duggan steering this new BBG decided to wait and see how many people would turn up and at 9pm proceeded with the launch when 75 guests had arrived. Mr. Richard Hyde, the British Deputy High Commissioner Hyderabad called for a minute’s silence and then proceeded to explain how he saw BBGH assisting BDHC and UKTI in their task of getting UK business into Hyderabad and Indian businesses to the UK. Gerry Duggan made a presentation outlining the operations and aims of BBGH and how important it was to attract actual UK business connecting members to BBGH. Also called on candidates to become part of the new Management Committee at the next meeting 21st March 2013 at Taj Deccan. Mary Priya Paul then closed the meeting with thanks to all the sponsors and attendees while passing sympathies to the people of Hyderabad who had suffered as a result of the bombs. Drinks and snacks were provided over Fellowship. Of the 75 guests, it was felt that 30-35 members would register formally before next meeting. “The Beacon Fellowship Charitable Award” supported by JP Morgan for 2013, recongnises the various forms that philanthropy can take and this award for impact investment honours those who have imaginatively used their financial resources to promote the public good, without necessarily depleting their fiscal resources in the process. Impact investors are primarily motivated by a social, environmental or charitable challenge, but seek to generate a positive ‘blended’ return from their investments, of both social and financial nature, often with the goal of expanding their philanthropy resources, rather than seeking enrichment for its own sake. In the image, Mr. John Pontin, OBE and Wendy Stephenson can be seen receiving the award. On 25th of February, Hand in Hand celebrated its 10 years of service to the community in a function in the shore temple town of Mamallapuram. 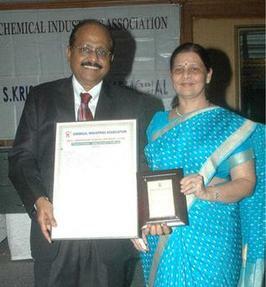 Its CEO, Dr. Kalpana Sankar is a member of BBG Chennai. Hand in Hand India is a grass root level NGO serving in 8 States in India and 7 countries across 3 continents. It has an integrated program of poverty elimination and women empowerment through various programs. With the support of its dedicated team comprising 2,500 employees of whom 65% are women, as well as 52,000 volunteers, Hand in Hand India has involved 8.5 lakh women in 57,000 Self Help Groups. It has also mainstreamed nearly 1.65 lakh children , after eliminating them from child labor. Creation of 1.3 million jobs. This was a 5 year programme, scheduled to conclude in 2014. Due to the indefatigable energies and commitment of the Hand in Hand family, the goal was achieved in January 2013, which was 14 months before target date. Crossing the threshold of Child Friendly Panchayats. A panchayat is designated as “Child Friendly” once child labor has been totally eliminated and all the children there attend school. The program was graced by a galaxy of dignitaries which included Mr. N. Sanyal, IAS, Special Secretary – ministry of Women & Child Development, Govt of India; Ms. Jennifer McIntyre – U S Consul General : Guest of Honour; Mr. Siddharth Varadarajan – Editor : The Hindu – who delivered the Presidential Address; Representatives from the leadership teams of various Hand in Hand arms across the globe, viz. UK, Sweden, South Africa, Kenya, Afghanistan; Board of Trustees of Hand in Hand India and all employees of Hand in Hand India from rural interiors across all 8 States where they serve. Dr. Kalpana Sankar, CEO, and the force behind Hand in Hand India, while felicitating all employees as well as thanking all donors, partners, well-wishers and supporters, made a presentation on the overall vision as well as the plans on going. 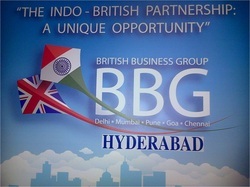 The 17th meeting of BBG Chennai was held on 21st February at ITC Grand Chola. Our Chairman, Christie Cherian welcomed the gathering and kickstarted the monthly meeting. Firstly, he thanked Mr. Philippe Charraudeau of ITC Grand Chola who had sponsored the meeting. Then he made announcements of the meetings and social initiatives and other initiatives that BBG is embarking upon. The first part of the meeting was a members Presentation by Nitin Seth, Executive Director (LCV & Defence), Ashok Leyland. He shared the story of Ashok Leyland and how it has build a sustainable and profitable business over the years. This was followed by a preview of the BBG website by Vikas Chawla from Social Beat who have re-designed the website to give it a more professional user interface. Our patron and British Deputy High Commissioner for South India, Mike Nithavrianakis updated the members on the recent initaitives including the visit by British PM David Cameroon and also the forthcoming visit of British Deputy High Commissioner in Trivandrum. He also graciously invited all the members to the Queens Birthday Celebrations on the 6th of March. Mike also took the opportunity to introduce the speaker of the evening, Ravi. 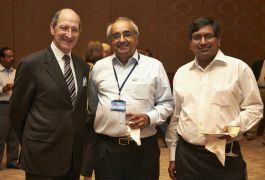 Ravi Viswanathan is the President of the TCS Growth Markets business. He also heads the Chennai Operations, which has an employee base of over 64000 employees. He has been in the Tata Group for over 25 years and has been an integral part of TCS strategy formulation and execution teams. Over the course of the evening he shared the success story of TCS with an emphasis on its UK operations and how local employees form 50% of the workforce. The evening concluded with notices from Balajee and Vote of Thanks by Louise Dawson. 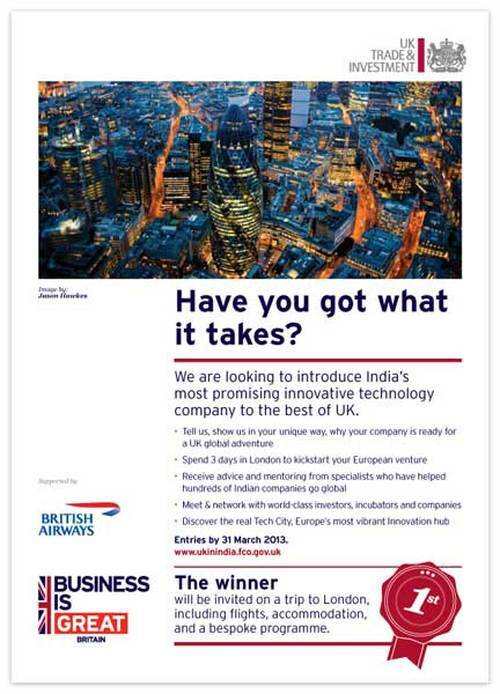 UK Trade and Investment (UKTI) recently launched a contest to identify and introduce India’s most promising innovative technology company to the best of UK. The company with the most compelling proposal gets to visit London for an extensive programme that includes receiving specialist advice, the chance to network with world-class inventors, incubators and companies in the UK. The contest is open until 31 March 2013 and more details can be found here. Have you got what it takes? TVS Logistics acquires UK-based Rico LogisticsA prominent business group in Chennai, TVS Logistics Services has recently acquired 85% stake in UK-based Rico Logistics, a distribution and inventory management company. Going forward, both companies will operate under the brand, TVS Supply Chain Solutions. The total cost of acquisition was Rs 100 crore, and has been funded through KKR fund (which invested Rs 265 crore in January 2012) and through internal accruals. TVS Logistics currently has a turnover of Rs 2,500 crore and the acquisition of Rico Logistics would help the company add new service capabilities like ‘last mile connectivity’ and help TVS Logistics enter new service verticals like IT and telecom products service. Managing Director of TVS Logistics Services, R. Dinesh recently mentioned in a press note that there are three more acquisitions on the cards. Our member, Abhaya Kumar, Founder and Managing Director of Shasun Chemicals and Drugs Limited, was recently awarded the Rasa Udyog Ratna Award instituted by Chemical Industries Association. He received the award for his achievement as successful businessmen, philanthropist and educationist. Shasun Group is a $ 500 million company and Abhaya continues to be the visionary who was always one step ahead of others. Apart from his role in Shasun, he is the chief donor and promoter of Sri Shankarlal Sundar Bai Shasun Jain College for Women. He is also a Senate Member of Bharathiyar University, Member Academic Council, Anna University, and Member, Exnora International.